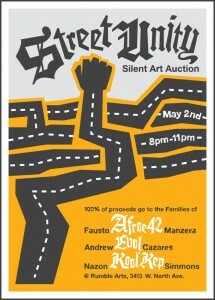 Art Show and Benefit for the Families of Fausto Manzera, Andrew Cazares and Kool Kep, Rest In Peace. Upset will be holding a silent art benefit Saturday, May 2nd in Chicago. All money raised will go to the families of Andrew Cazares, Fausto Manzera, and Nazon Simmons. Thank you to Stef for all your help and to Rumble Arts Center for letting us use their space. A huge list of artists involved will be announced soon! Artwork will go for cheap and is for a great cause. Don’t sleep!